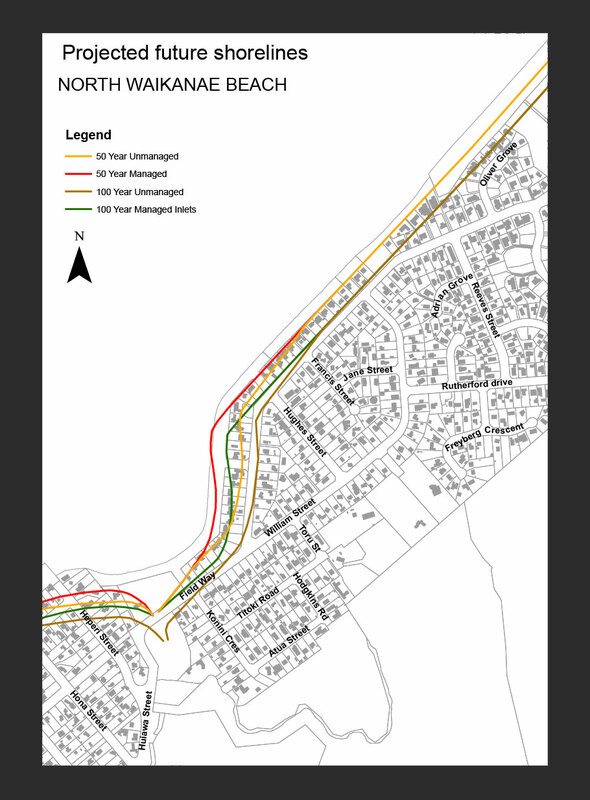 Between 2006 and 2014 Coastal Systems Ltd (CSL) carried out several coastal erosion hazard assessments for the Kapiti Coast District Council (KCDC) to assist in revising their District Plan’s building setback lines after council recognized the existing lines, based on 1980s information, were inadequate. 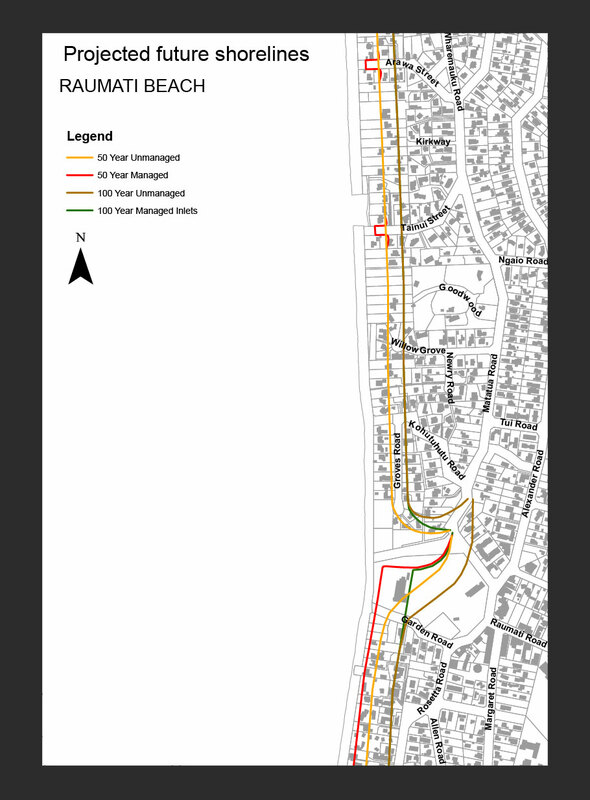 The assessments covered the open coast, inlets, areas with structural controls (seawalls, groynes etc), used 50 and 100 year projection periods, and assessment detail ranged from high level for red-flagging potential high risk areas to site-specific investigation where development was imminent. The assessments were carried out using best practice methodology and thoroughly peer reviewed. CSL’s most comprehensive assessment report and accompanying erosion prediction maps were released in August 2012. The KCDC also sent letters to 1800 affected properties placing severe building development restrictions within both the 50 and 100 year erosion prediction envelopes and informing them that the new erosion information would go on LIM reports forthwith. This action resulted in an immediate public outcry and formation of the high-profile pressure group Coast Ratepayers United (CRU). CRU set out to block implementation of the CSL erosion prediction lines into District Plan hazard zones (this process would have included public input and adaptation strategies), by relentless challenge of the CSL assessments via Kapiti and Wellington media as well as their own web site. To subdue coastal property owners, the KCDC agreed to appointed an independent panel of 4 experts who reviewed the CSL assessments in late 2013. The Panel recommended implementation of the CSL assessment material into the District Plan once three “easily effected” changes were incorporated, i.e. “modify and apply” . The main change involved use of an alternative approach for computing one of the five hazard model components. CSL strongly objected to the alternative which had been shown in the literature to over-estimate erosion and was not used elsewhere, whereas the method used by CSL was consistent with NIWA best practice guidance. The Panel’s approach would have seen the CSL hazard prediction lines several metres further landward, so their modify and apply recommendation was problematic for the CRU, who had consistently claimed that the CSL lines were too far landward. The Panel had also recommended broader investigations that could reduce uncertainty but stressed that this was longer-term work and would be used to inform the following District Plan Review 10 years time. CSL had already formulated a future research programme for the KCDC to achieve these sorts of refinements – a programme spanning several years to enable data collection and cost spreading. This secondary recommendation by the Panel was seized upon by the CRU and the new council. In particular, the KCDC ignored the Panel’s primary recommendation to “modify and apply” the CSL assessment lines, rather, they would appoint a Coastal Advisory Group (CAG) to oversee a new broader assessment, with implementation of this work into the District Plan by 2018. In 2012-13 coastal residents also sort a High Court Judicial Review to exclude the CSL erosion information from LIM reports. However, the judgment found the council had no discretion in this regard and had to make the information available in a clear manner – the Judge finding this was something council officers (without any CSL input) had not succeeded in doing. Nonetheless, under CRU pressure, the council removed all explanatory text and erosion prediction maps from LIMs, referencing only the CSL report along with a potentially misleading disclaimer on the report’s front cover, and the maps were unavailable. As the Code of Ethics used by coastal practitioners requires us to inform those affected by possible consequences of our findings, we subsequently made the full set of reports, maps and clear explanation available for download on the CSL website (click here). Following publication of the erosion prediction maps and discussion of the erosion hazard process on the CSL website in 2014-15, CRU advisors wrote a 114 page submission to the Advertising Standards Authority requesting that the CSL site be shut down on the basis of content accuracy. However, the Authority refused the CRU request and suggested, given the extent of the applicant’s grievances, they take legal action. The matter did not proceed further. The KCDC prepared draft terms of reference for a coastal advisory group (CAG) which the CRU rejected while they sort determinations (definitions) on a range of matters through the Environment Court. In addition, it appears that the council had no real inclination to carry out an expanded assessment as it seems no budget was ever allocated for this purpose. In November 2017 the (Reviewed) Proposed District Plan was released with no erosion hazard provisions – the council stating that the provisions in the Operative District Plan having to apply until the new assessment and implementation process has occurred, i.e. in several years time. In December the High Court upheld an earlier Environment Court decision that this process was acceptable. However, it is noted that the Courts’ were led to believe that the CAG/expanded reassessment was actually underway, when in fact CSL understand that there has been minimal progress. Since 2014, erosion hazard assessment methodology has further developed with the advent of probabilistic analysis software (click here), which Tonkin and Taylor first applied for the Northland Regional Council in 2014, and they have subsequently used it at other locations in both the North and South Island. Probabilistic-based analysis enables a continuous range of likelihoods to be computed for different scenarios. This compares with the single likelihood computation method used in the past. The probabilistic approach also facilitates sensitivity testing which is helpful in assessing the relative contributions of the different hazard model components and their parameter values. The CSL Kapiti erosion output have been tested using this new approach and the 100 year prediction line was found typically to have a probability of 4% which meets the very unlikely (1 to 10%) requirement in the current New Zealand Coastal Policy Statement (NZCPS) for new development and subdivision. The CSL 50 year line, the surrogate for the likely scenario (which the NZCPS requires for existing development), had a probability of 89%, making it somewhat conservative, i.e. it under-estimates erosion with the actual value further landward.. 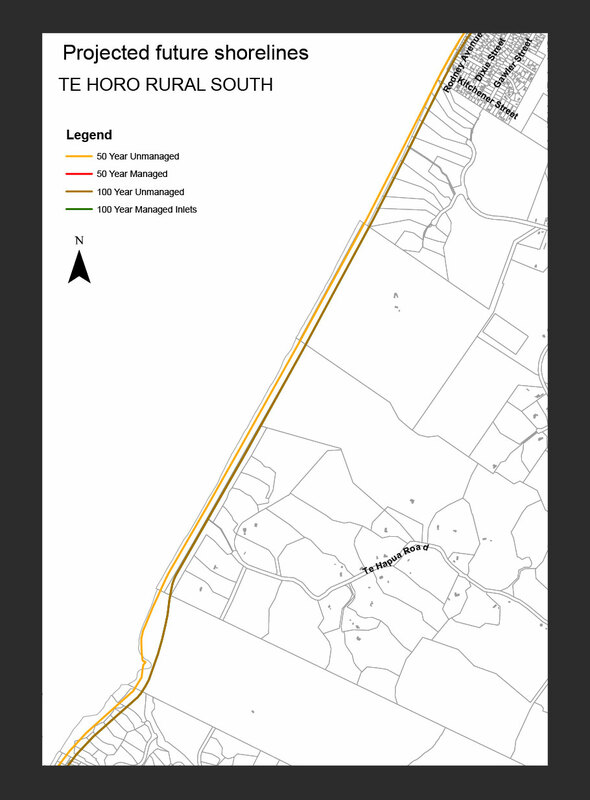 The Pegasus Bay Coast to the east of the Waimakariri Rivermouth was subject to a coastal hazard assessment in 2015 by Tonkin and Taylor for the Christchurch City Council (CCC). Once again substantial negative resident reaction followed release of the assessment, fueled by the appearance in Christchurch of the Kapiti CRU who ensured an independent expert panel reviewing the assessment, and challenge of assessment material appearing in LIM reports. And again the Panel recommended the assessment be used as a basis for implementation of coastal hazards into the District Plan subject to addressing several matters. However, the CCC response was dramatically different to the KCDC’s. The CCC instructed their consultant to address the issues raised in the Panel’s review. And quite correctly, the consultant rejected some of the issues which were non-substantive. Furthermore, the assessment information was included directly into LIM reports, with a caveat noting limitations until the final assessment was completed. The Christchurch case is now about to move into the implementation phase. Since 2012 the KCDC’s erosion hazard process has become extremely political and heavily influenced by the coastal residents. In 2014, council rejected the Expert Panel’s recommendation to modify and apply the CSL assessment and opted instead for a revised assessment to be implementation by 2018. However, it appears there has been minimal progress in this regard. The council accepts that the existing hazard zoning in the Operative District Plan is inadequate. The present situation is untenable. Hazard zone implementation would utilize these results and follow the new MFE 2017 guidance regarding community and cultural input together with adaptive strategies to derive final hazard maps and rules. 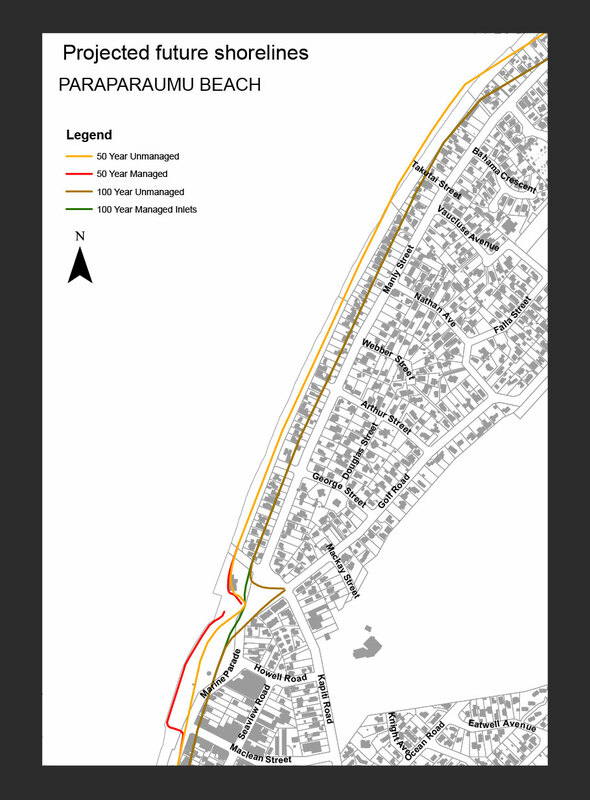 Materials on this CSL web page clearly show that the Coastal Systems Ltd (CSL) hazard lines adequately define “potential” shoreline erosion along the Kapiti open coast and inlets for the purpose of assigning hazard zoning (building controls) in the District Plan Review that has been ongoing since late 2012. However, in mid 2014 the then newly elected Kapiti Coast District Council (KCDC) withdrew hazard zoning from the current District Plan review process in response to intense resident lobbying and backing by local media. 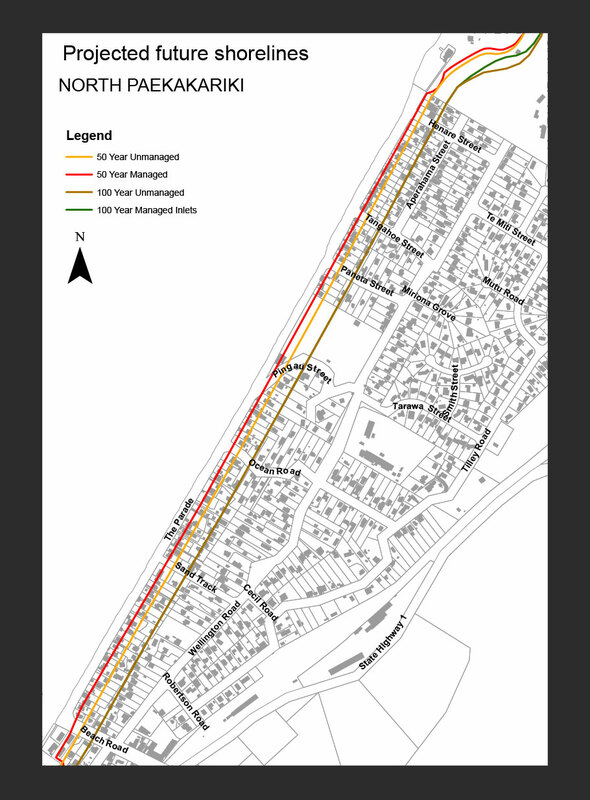 The 1,800 properties reported to be captured by the CSL 100 year erosion hazard line is seriously misleading as this line only has relevance for new (large-scale) development such as subdivisions. 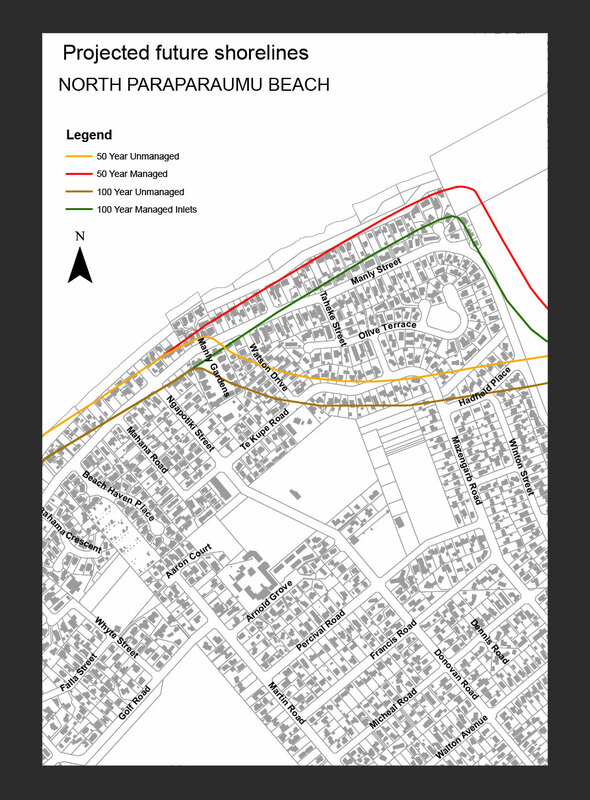 It is the 50 year erosion line (managed rather than unmanaged for locations where there is an option) that applies to existing dwellings and there are only a few hundred such affected properties, i.e. seaward of this line. These properties, located on the highly erosional South Coast and around unstable inlet margins, are likely to be subject to future building constraints and prospective purchasers must be made aware of this. However, since 2014 the KCDC has withheld this information from LIM reports. CSL adopts the IPENZ Code of Ethics which requires practitioners to inform those affected by possible consequences of their findings. The CSL information on this web site, including downloadable erosion hazard assessments and maps, is provided for the benefit of existing and potential property owners, coastal professionals and others with interests in coastal erosion. 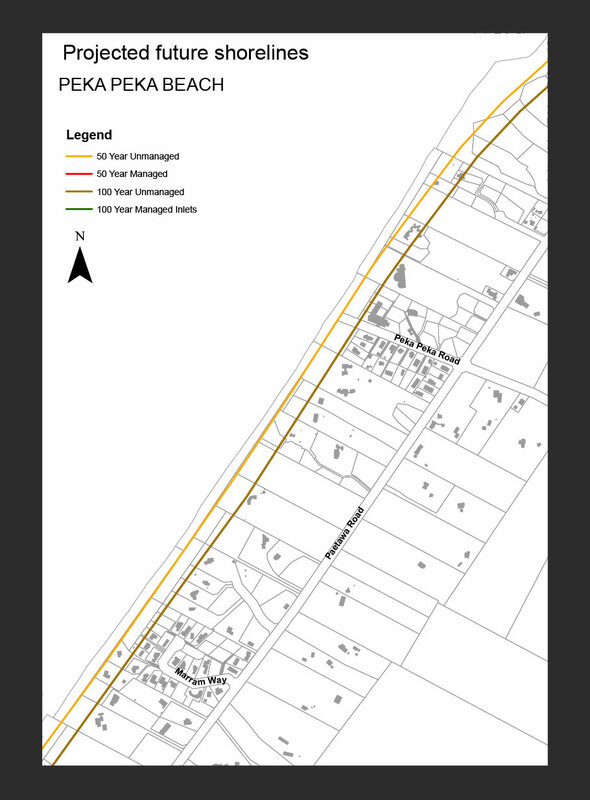 Maps (downloadable) of erosion hazard lines. 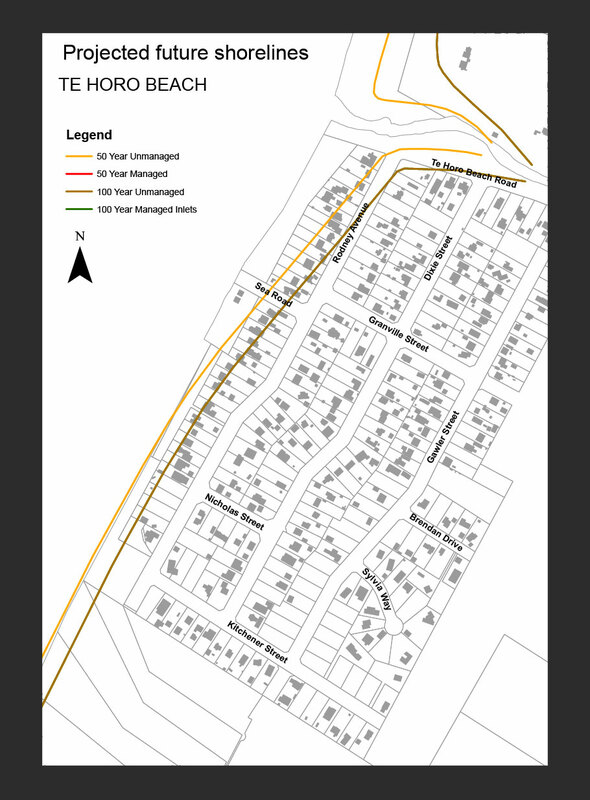 Erosion Hazard Prediction and Planning (zoning) Lines. Maps of erosion hazard prediction lines. Click here to download complete PDF. In 2008, Coastal Systems Ltd (CSL) prepared a comprehensive erosion hazard assessment for the 38km long Kapiti Coast including its 12 inlets. In 2012 the assessment was updated to be consistent with provisions of the revised New Zealand Coastal Policy Statement 2010. 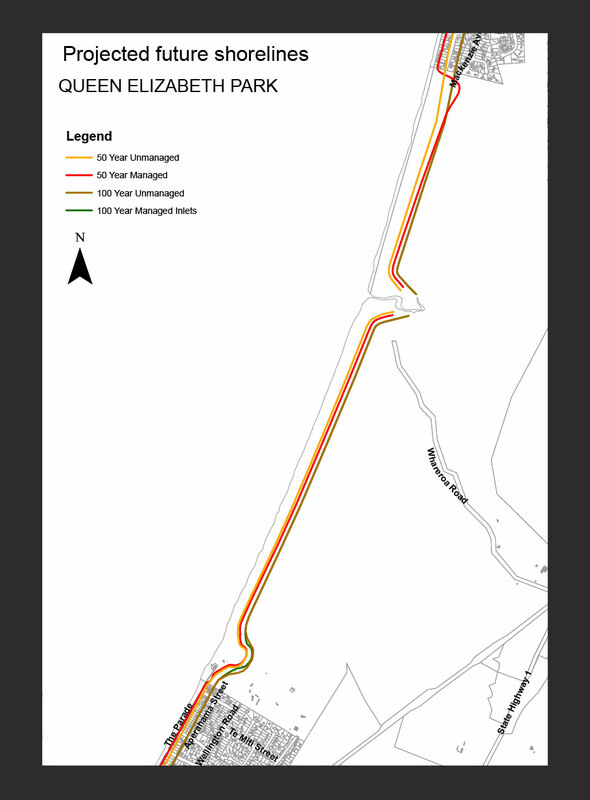 Processes along the Kapiti Coast are highly variable and a range of unmanaged and managed sections occur. The assessments considered both managed and unmanaged scenarios. The assessment methodology was based on industry best practice and resulted in one of the largest, most complex and detailed coastal erosion assessments ever carried out in New Zealand. As is usual, the district-wide assessment provides a first pass approach to “red flag” areas with “potential erosion hazard”, and for areas of particular interest, site-specific assessments may subsequently be undertaken with a view to improving predictive accuracy: this often results in hazard lines being adjusted seaward. It is noted that the High Court has recently defined potential erosion as a “reasonably possible worst case scenario” (CIV-2012-485-2577  NZHC 43), while CSL defined potential erosion similarly as that “occurring under an extreme set of circumstances” and our modelling derives a hazard distance with a “very unlikely” chance of occurrence by careful selection of component probabilities. The CSL assessments were extensively reviewed by well respected and experienced practitioners and academics who provided comment on either the production stages of the assessment process, or on the completed report. However, upon release, affected beach residents failed to appreciate or accept the assessments were based on a very low likelihood of hazard occurrence as required by best practice (NIWA 2012), statute (NZCPS, 1994 and 2010) and now case law (CIV-2012-485-2577  NZHC 43). Residents argued that erosion assessments should be carried out at a likely level. They failed to recognize that the 50 yr prediction line (c.f. the 100 yr line) applies to areas with existing building while the latter applies to new development. Residents also failed to appreciate/engage in the interactive process available in which the council would allow for experts representing affected parties to caucus with their consultant (CSL) in an effort to increase the level of accuracy in the assessments. By contrast, Kotuku Parks Ltd. instructed their coastal consultant to work with CSL to produce a “site-specific” assessment, the result of which benefited the developer (see Section 4 below). Following nationally unprecedented resident-driven media criticism along with pressure from the pending 2013 election , the Kapiti Coast District Council (KCDC) subsequently engaged an additional panel of three independent coastal experts (from NSW, Oregon and Auckland) to consider public submissions and provide further review of the CSL assessments. This “Expert Panel” met in early December 2013 and in their final report (June 2014) found that the CSL assessments were based on appropriate data, methodology and level of hazard occurrence. The Panel identified two science-based modifications and recommended that these could easily be addressed and should be done so immediately with the revised output then being used as a base to derive erosion hazard zonation in the District Plan Review currently underway. The main issue concerning the Panel was CSL’s estimation of short-term erosion (one of 5 components used in the hazard model), and the Panel recommended an alternative approach developed by member Professor Komar: a geometric translation based on extreme water levels which would result in the final Kapiti erosion prediction lines being located tens of metres landward of the present CSL lines. When initially designing the project, CSL had considered this method, but rejected it as being overly conservative with its predicted results being several times greater than observed erosion during extreme events. Furthermore, we know of nowhere else in New Zealand where it is used and applied for landuse planning. By contrast, CSL used an empirical-statistical method is based on the statistical analysis of actual shoreline data as allowed for under New Zealand industry best practice. After realizing their own consultant (CSL) had grave concerns at the short term erosion component aspect of the Panel’s finding, officers applying “due diligence” would have immediately commissioned a further independent expert (acceptable to all parties) to provide additional opinion as to which is the more appropriate short-term model. Of particular relevance in this regard is the 2016 finding in the “Christchurch Expert Panel’s Review” of the Tonkin and Taylor “2015 Peagus Bay hazard assessment“, in that they supported use of the same empirical-statistical approach used in the CSL Kapiti assessments. The Kapiti Expert Panel also recommended several areas of research that could be undertaken to reduce hazard uncertainty for future District Plan Reviews; these could have easily be incorporated into the council’s research programme that was already being developed by CSL and KCDC officers for hazard application in future assessments. 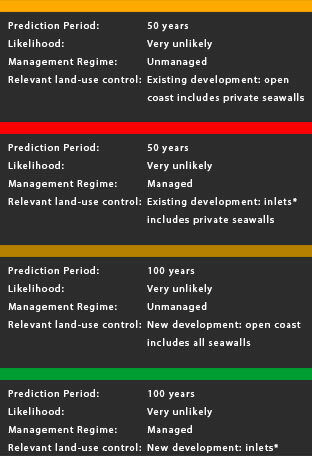 In June 2014, the newly elected Kapiti Coast District Council decided to ignore the Expert Panel’s recommendation of immediately remedying the CSL predictions (although as noted above, CSL does not consider there was anything of substance that requires modification), and applying the output to derive erosion hazard zones for use in the current District Plan review. 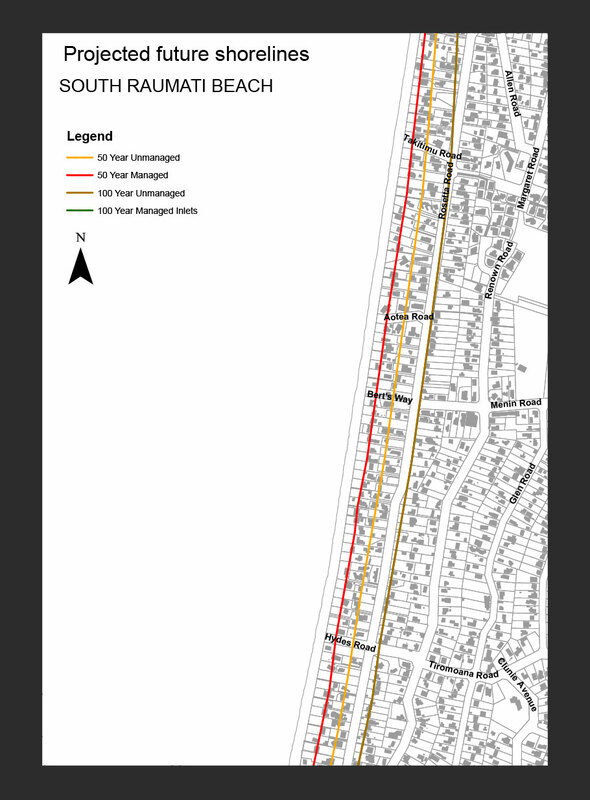 Instead, the council decided to exclude erosion hazards from the current District Plan review, possibly because the hazard prediction lines the Panel advocated would be further landward than the CSL lines! 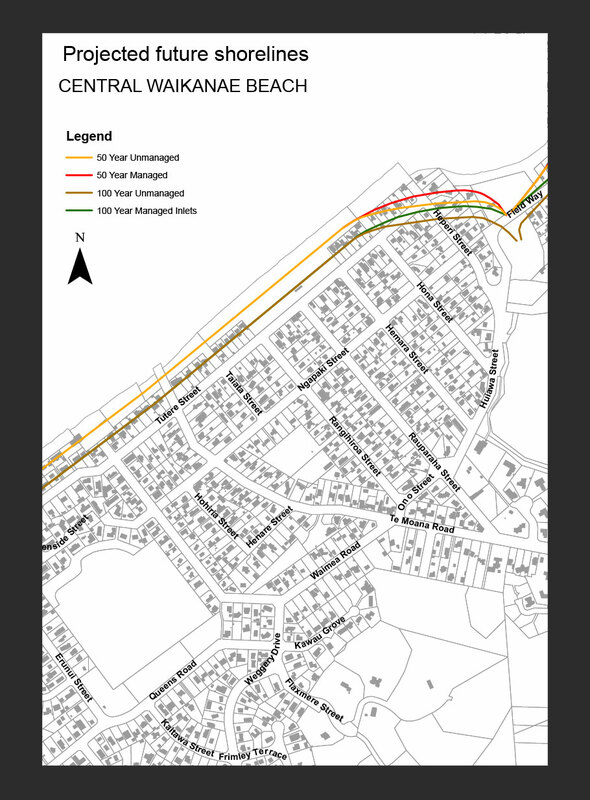 The council decided to simply pursue hazard research which would mean waiting several years before any science-based erosion assessment can be completed, and even longer before any hazard zoning appears in the Kapiti Coast District Plan. At the time of updating this web page the KCDC has yet to proceed in its stated intention of persuing a research programme. At its first meeting in December 2013, the newly elected KCDC removed the CSL hazard maps and other materials from LIM reports and provided only a reference. We understand the council subsequently removed all reference to the CSL assessments in LIMS and on their web site. However, a High Court decision in January 2015 [case CIV-2012-485-2577  NZHC 43] e.g. paragraph 11, found the CSL information on potential erosion had to go into LIM reports, the council having no discretion in this regard. Furthermore, the 2015 report by the Parliamentary Commissioner for the Environment on “Preparing New Zealand for Rising Sea Levels” [p66] warned that councils could be found negligent if they hold relevant information and fail to provide it clearly, fairly and accurately. By its omission, the KCDC risks litigation by future residents. The following sections (listed in the side bar) elaborate on the above summary material. The final section on New Hazard Research describes (downloadable) research papers published after the CSL 2012 assessment was completed. CSL will add to this section as new hazard research comes to hand. 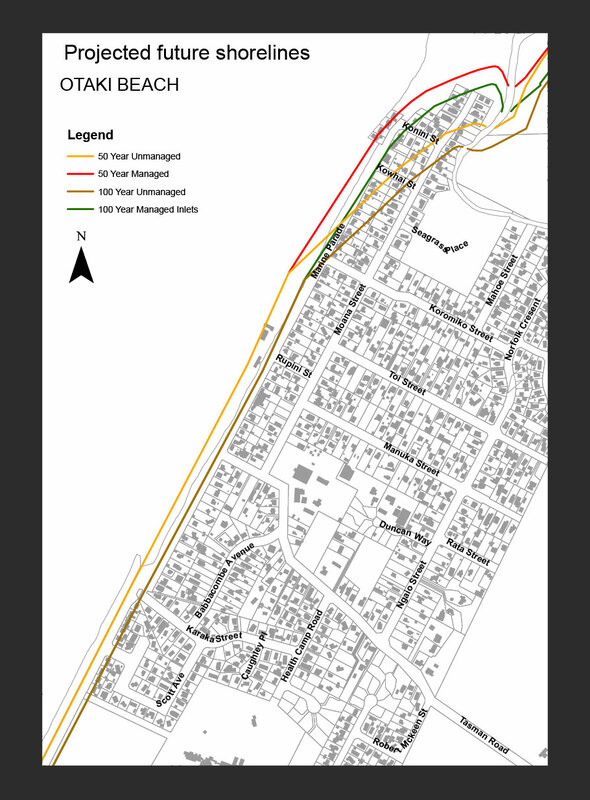 In 2008, CSL completed one of New Zealand’s largest, most complex, and most detailed coastal erosion hazard assessment for the Kapiti Coast District Council (KCDC) [pdf 1 and pdf 2]. The assessment covered 38 km of coast and included shorelines undergoing systematic erosion and accretion as well as large amplitude cross-shore fluctuations which result from the varying sediment and energy regimes. The assessment also included 12 inlets of varying size, geometry and flow regime. A range of protection and/or control works also exist as well as softer management techniques being used for both open coast and inlets, and the erosion assessment included both managed and unmanaged scenarios. LT = longer-term historic shoreline change. ST = Shorter-term shoreline fluctuation. RSLR = Shoreline retreat associated with sea-level rise (SLR) induced by global warming. This refers to the safety margin derived by combining the measurement error which is the combined errors (usually random) associated with the other four components, together with a range of other factors (precautionary measures used in post-component processing) which serve to increase the overall safety margin. These other factors which were quantifiable were included in the combined uncertainty (CU) value. The empirical approaches incorporated substantially more data and statistical analysis than used for other district-wide assessments at the time. All data and analysis were included within the assessment report. Such (generic) assessments apply a component-based general model to a section of coast using data sampled from that area. The assessment was subject to both project (ongoing) review, from the initial planning stage, and also final report review, by respected and experienced practitioners and academics. 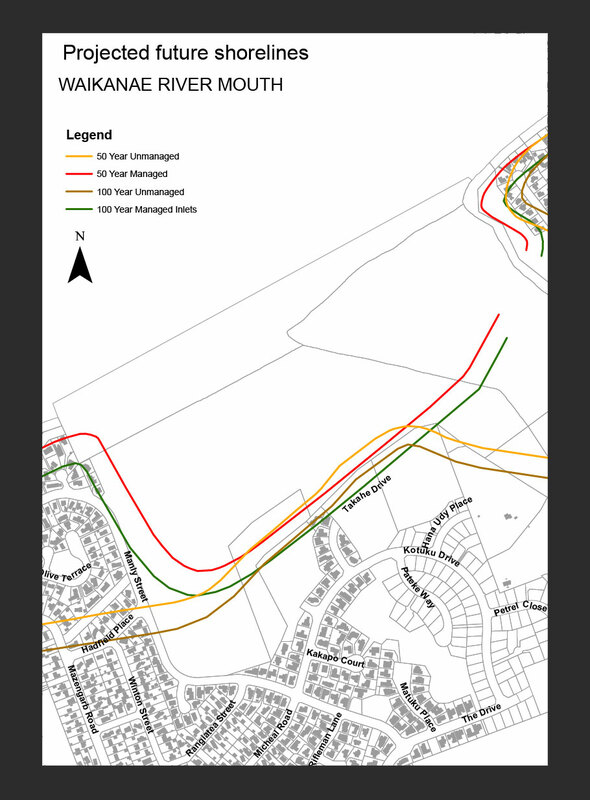 The assessment was typical of those carried out for local government in that it was a first pass approach suitable for red flagging potentially hazardous areas using a conservative approach, with the output suitable for use in developing building controls in local government planning. As is usual, it allows for subsequent more detailed site-specific assessments with zoning modified when justified. Rather than implement the 2008 predicted erosion lines into their District Plan at that time, the KCDC placed the process on hold pending the expected release of the revised New Zealand Coastal Policy Statement. However, the council did immediately begin including relevant material from the assessment in LIM reports as required by legislation. It is particularly noteworthy that there was no public response to the 2008 assessment, presumably because the 50 year prediction period output resulted in relatively few existing properties being affected. for increased uncertainty associated with predicted climate change. It is noted that “potential erosion” is typically interpreted by practitioners as erosion occurring under an extreme set of circumstances and as such is “very unlikely” to occur. It is noted that the High Court has recently defined potential erosion as a “reasonably possible worst case scenario…i.e. a worst case scenario objectively determined and evidentially based” (CIV-2012-485-2577  NZHC 43). Such definitions are entirely appropriate as developers, prospective purchasers and insurers want to know that in the future their property of interest will be virtually free of erosion hazard. The 100 yr prediction period and upward revised sea-level rise (SLR) values resulted in landward offset of 2008 erosion prediction lines. After a lengthy review and revision process, the updated CSL assessment was completed in August 2012 [pdf 3] and thereafter incorporated (implemented) into the KCDC Proposed District Plan. CSL was not involved in the implementation process nor in the subsequent public consultation process. 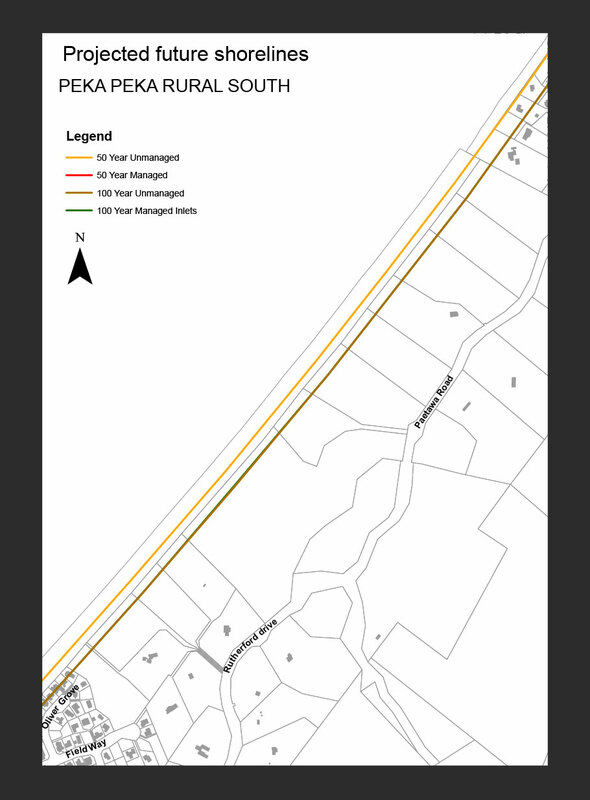 Kotuku Parks Ltd had recently developed a subdivision along the landward side of the Waikanae Inlet. 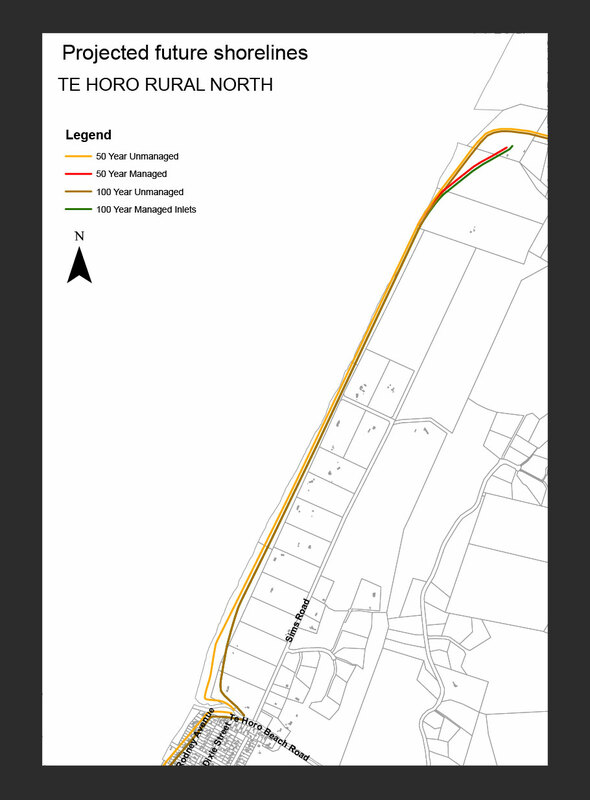 The company engaged an experienced Coastal Engineer (Mr Angus Gordon) to prepare their district plan hazard submission and to address coastal characteristics specific to this particular location. Based on these materials it was decided a site-specific assessment was warranted. 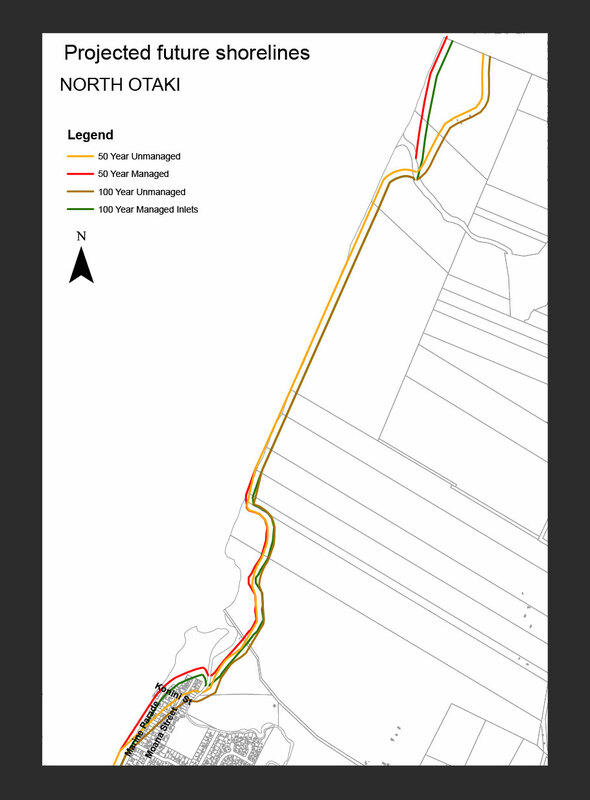 The assessment [Kotuku site-specifc pdf 4A] was carried out by CSL in association with Mr Gordon and, as is typical of a site-specific assessment, used a range of additional data relevant to the site along with the development of an inlet model specific to this section of coast. 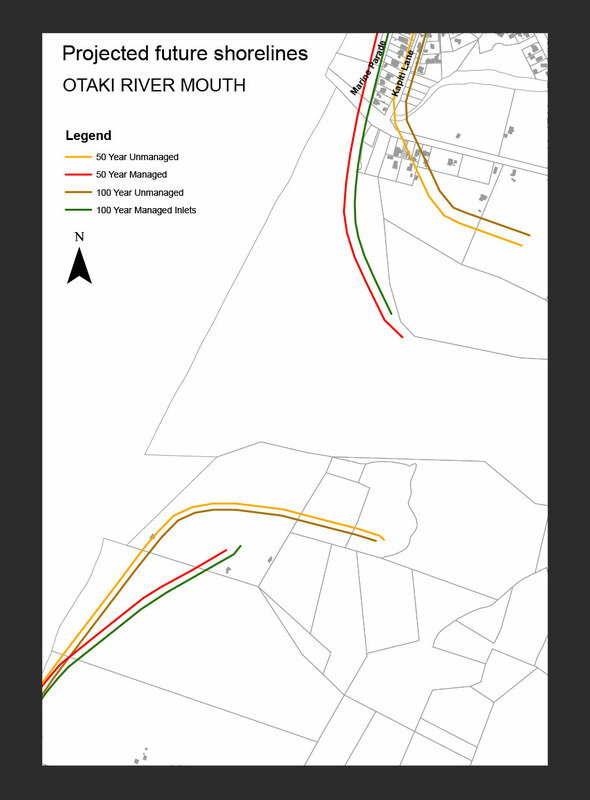 The resulting prediction lines (managed and unmanaged) were located somewhat seaward of the 2012 generic lines clearly demonstrating how refinement can reduce uncertainty; this is an inherent part of the erosion hazard assessment process from general (red flagging) to detailed (site specific), but carries with it a substantial increase in cost. Resident submissions to the District Plan Review noted deficiencies in the managed regimes operating at the Waimeha and Mangaone inlets and as these could affect the location of erosion hazard predictions, CSL were instructed to reassess these sites. In the case of the Waimeha, a control structure had been overlooked and in the case of the Mangaone a managed regime had not been assessed as we had no information that this occurred. Once the Wellington Regional council provided details on the management regimes, any further available information (e.g. additional aerial photos or LIDAR) was collated and the inlets reassessed [Waimeha pdf 4b, Mangaone pdf 4c]. As expected, in each case the hazard lines shifted to more seaward locations. The council stopped the CSL reassessment process in early 2014. 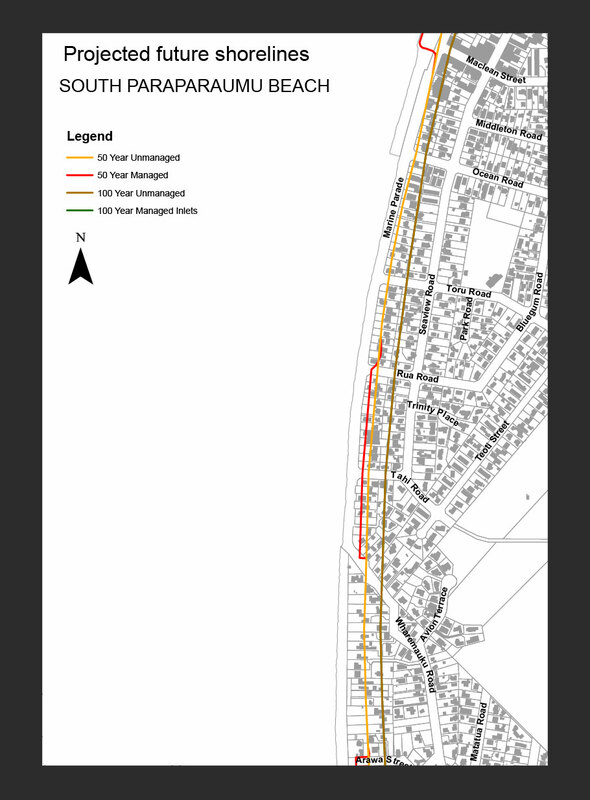 Due to the extensive area of coastal land potentially affected by future erosion along with the high number of public submissions, in April 2013 the council decided to appoint independent experts to assess the submissions and further consider the CSL hazard analysis. Three coastal experts were appointed: Professor Paul Komar (retired) an Oeanographer from Oregon State University, Dr Paul Kench, a Geographer from Auckland University and Dr James Carley, a Coastal Engineer from the University of New South Wale’s Water Research Laboratory, along with a statistician, Dr Robert Davies. In December 2013, the Panel heard submitters and then caucused with the council’s hazard consultant Dr Roger Shand (CSL), the council’s implementation consultant Mr Jim Dahm (Focus Consultants), Kotuku Park Ltd’s consultant Mr Angus Gordon, and Dr Willem De Lange (Waikato University) who had advised the coastal residents. Several residents also attended the caucusing. The panel produced a draft report in March 2014 and subsequently received written feedback. The panel’s final report [pdf 5] was released in June 2014. The CSL erosion assessment was (a) carried out at the correct level, (b) used high quality data and (c) used reasonable analysis. The panel thought that the empirical-statistical method used by CSL to estimate shorter-term erosion may be effected by under sampling (and hence under-predicting erosion), and recommended using the geometric translation method developed by senior Panel member, and the principal author of the Panel’s report, Professor Paul Komar. The erosive effect of sea-level rise (SLR) during the 20th century had not been removed from the historical shoreline data, hence potentially over-estimating erosion associated with sea-level rise projections. The panel noted various areas of research that could be carried out to lessen uncertainty but recommended this future work for inclusion in a later assessment and district plan review. Of the submitter criticism, the panel thought that a more detailed explanation would be helpful of how inlet and open coast erosion prediction lines were merged. 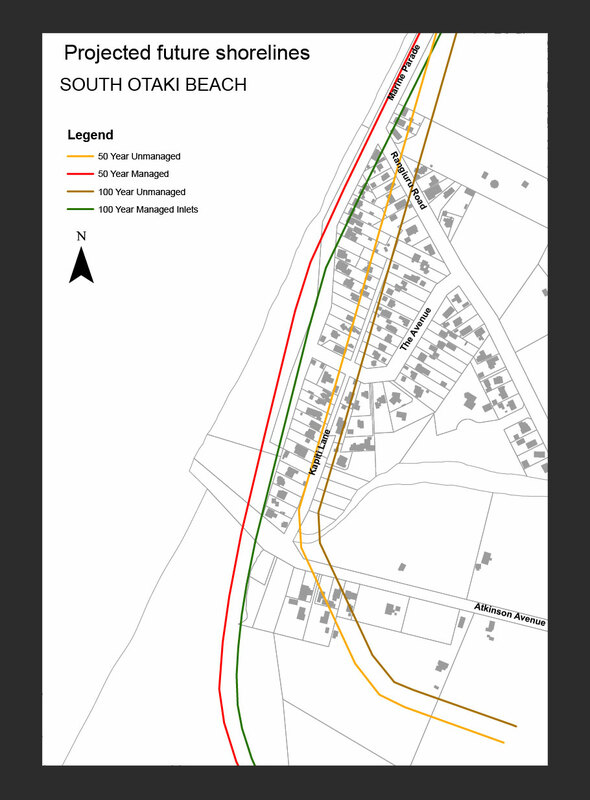 It is noted that the residents and their technical advisor (Waikato University academic Dr Williem de Lange) argued that the assessment should have been carried out at a “likely” level of hazard occurrence rather than at a “very unlikely” level. The Panel rejected their submissions. The New Zealand Coastal Polity Statement 2010 requires that coastal hazard assessments be carried out at the “potential” level and practitioner best practice carries out coastal hazard assessments at the very unlikely level. As noted earlier in the Summary Section, the High Court has recently defined potential as “worst case” for use in the Building Act; however, we consider that is too extreme. This matter is elaborated upon below in the section on Erosion Hazard Prediction Lines and Erosion Planning Lines. 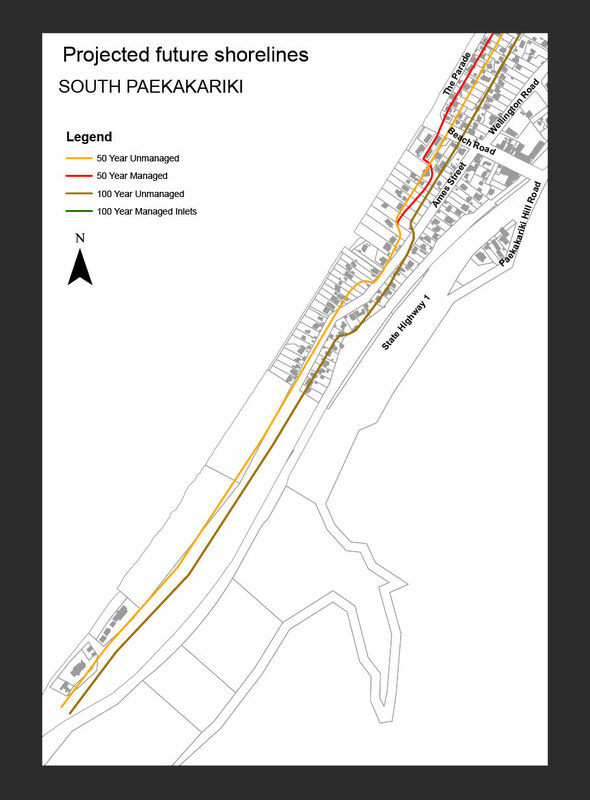 The “very unlikely” requirement led to the historical accretionary shoreline behaviour which occurs along parts of the Kapiti coastline not being incorporated into the long-term (LT) component, and this frustrated the residents. To appreciate the exclusion of accretion, it is necessary to take a millennium-based view of shoreline change. For example, at the foreland the average historical rate of change is 1.2 m/yr, yet over the past 2000 yrs the average rate is only 0.3 m/yr with terrestrial morphological signatures indicating periods when the shoreline was stable or may have eroded. The high recent (historical) rate may have been related to early Maori and/or Colonial land use practices, and/or volcanic activity, and/or the sea-level lowering of the late 18th/early 19th centuries. By contrast, a “likely-based” assessment would include an accretionary value. Use of the Komar method to estimate the short-term erosion component was considered by CSL when originally designing the assessment methodology, but rejected as calculations showed it would substantially over predict short-term erosion along the Kapiti Coast compared with observed historical retreat from extreme storms. For example, the Komar method computation gives 60 m of shoreline retreat (increasing a further 20% to account for rip channel occurrence), whereas observed maximum storm erosion on the South Raumati Coast is 15 m. By comparison the corresponding CSL short-term erosion value is 22.6 m which includes an uncertainty allowance. The particularly severe September 1976 storm details and photo series illustrating this example of extreme short-term erosion are displayed in this section. While the panel’s final report described ouput from the Komar method as being the “potential maximum dune retreat” over a 100 yr return period, this is misleading as the confining topography makes it impossible for the driving processes on the Kapiti Coast to occur over the necessary duration to account for this amount of erosion. CSL know of no other instance in New Zealand where the Komar method has been used as a basis for planning controls. By contrast, the empirical method used by CSL is often used in New Zealand erosion hazard assessments, it accommodates a wider range of process responses (e.g. morphological control of surf zone processes and river mouth control of sediment variation), and the Kapiti results are consistent with erosion observed during extreme episodes of erosion. Independent support for the CSL short-term values estimates has now been provided by newly published research in (see the New Hazard Research section below). The effect of historical sea-level rise incorporated within the long-term erosion estimate was clearly recognised in the CSL reports. Its deliberate exclusion was to make some allowance for future climate change effects (other than sea-level rise), as is required by the NZCPS 2010. For example, an increase in predicted wave height will in turn increase short-term erosion values. The alternative is to make provision by using a speculative safety factor. The hazard research directions raised by the panel will be helpful in reducing uncertainty, and CSL had already incorporated much of this into the council’s ongoing research programme. Resident concern noted by the panel can be addressed by the provision of additional text. CSL involvement in the consultation process could have easily resolved many resident concerns. While data and analysis for coastal erosion hazard assessment continues to improve (see the New Hazard Research section below), the generic CSL assessments remain reliable and fit-for-purpose with the very few issues raised by the Expert Panel either being easily addressed or dismissed altogether. On 11th to 13th September 1976 the most erosive storm event on record impacted the Kapiti Coast. The storm was caused by a slow moving complex depression that formed in the mid Tasman Sea. Over the next two days the storm deepened to 970 hPa and produced NNW winds which peaked at 67 kt at Paraparaumu Airport. The storm surge was estimated at 0.6 to 0.7 m and this was superimposed upon tides of 0.5 to 1.0 m. Waves peaked at 3.6 m and runup reached 5 m above MSL. Shorelines along the south Kapiti Coast were eroded up to 15m during a succession of high tides. Source material: Donnelley (1959), Gibb and Wilshire (1976), NIWA (2000). CSL’s 50 yr and 100 yr erosion hazard prediction lines are those derived in the CSL 2008 and 2012 assessments, and are depicted in the downloadable maps displayed at the top of this web page. As stressed earlier, the reader must appreciate that these lines are derived at the “potential” level of occurrence (NZCPS 2010) which practitioners (applied coastal scientists and engineers) take to mean occurring under a “very unlikely” set of circumstances. These erosion prediction lines were used by KCDC implementors to derive erosion hazard planning lines. CSL were not involved in this application so our comment here is in general terms. NZCPS 2010 (Policies 25 and 27) provide some guidance as to how the erosion prediction lines are to be used to define hazard zones. 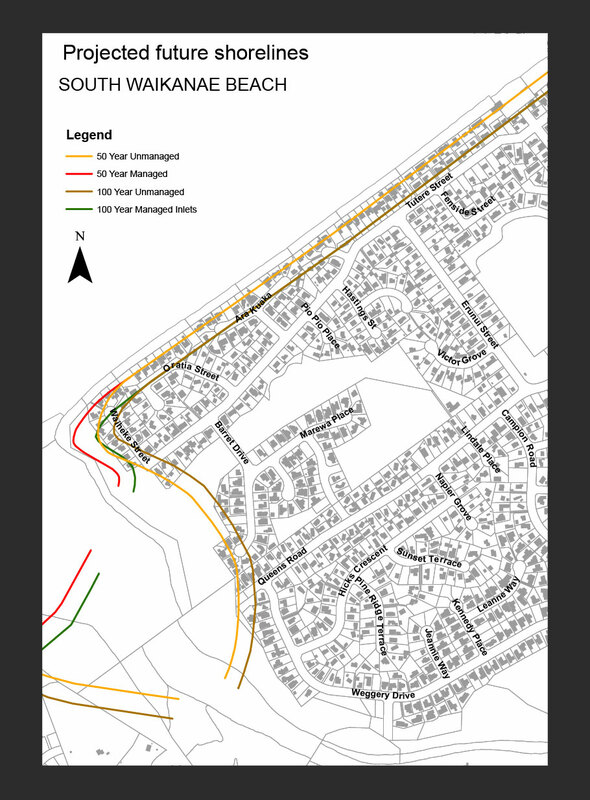 In particular, new (larger-scale) development such as subdivisions, is to be controlled by 100 yr potential (very unlikely) erosion hazard risk, while areas of existing development (including all dwellings) are controlled by 100 yr “likely” erosion hazard. House additions/alterations seaward of the 100 yr “likely” erosion line would be subject building controls such as the structure’s removal once erosion reaches previously defined trigger points. However, CSL’s Terms of Reference did not require the derivation of 100 yr likely erosion hazard lines. Rather we were instructed to define the 50 yr potential (very unlikely) line and the Planners/Implementors would use this line as the erosion hazard boundary for existing dwellings, i.e. dwellings seaward of this line would be subject to future building controls. With the recent development of probabilistic software (see New Hazard Research paper below), this equivalence assumption has now been shown be a slight under-estimate with the 50 yr potential line being somewhat seaward of the 100 yr likely line. In other words it turns out that coastal residents may well have been less restricted under the CSL assessment than under a future more highly refined erosion hazard assessment! It was perhaps not surprising that there was no resident response (outcry) during 4 years usage of CSL’s (2008) 50 yr lines in council LIM reports and on the council web site. 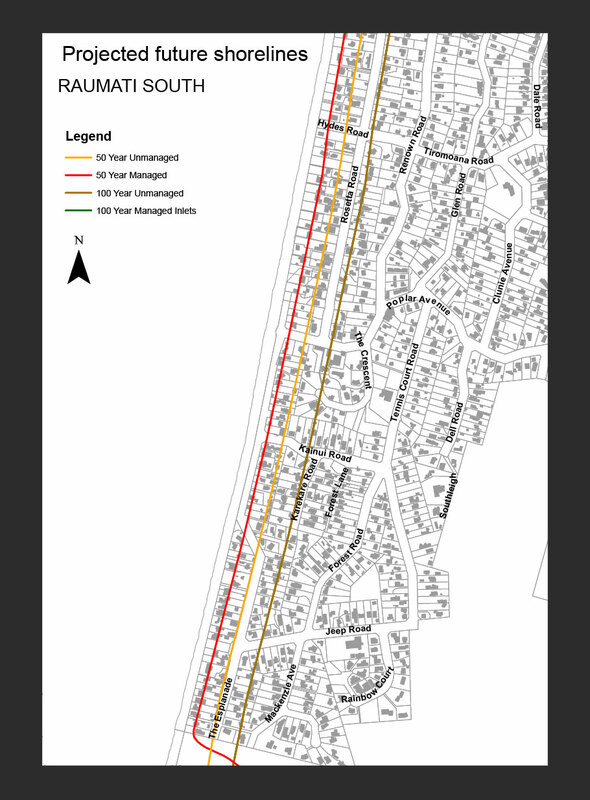 Finally, and most importantly, where there is an option, it is the CSL 50 year managed erosion hazard line that applies to existing dwellings rather than the 50 year unmanaged line as councils have said they will maintain community sea walls, inlet control structures and continue other types of management into the foreseeable future. The following research papers were published after the 2012 CSL assessments were completed and have relevance for erosion hazard assessments in general and the CSL Kapiti assessments in particular. Each paper can be downloaded by clicking on the title. 2013 A review of shoreline response models to changes in sea-level. By Tom Shand, Richard Reinen-Hamill, Roger Shand, James Carley and Ron Cox. Published in Proceedings of the Australasian Coasts and Ports Conference, Sydney. Shoreline response to sea-level change is often the largest contributor in an erosion hazard assessment so the assumptions and relative output between models is of particular relevance. This paper reviews the range of existing models (geometric equilibrium models and non-equilibrium process-based models) that have been used in the past to determine shoreline response to changes in sea-level. The paper also includes an output comparison for the models. The most common method used for sandy open coasts is the Bruun-type profile translation-based model for which a range of options exist for the assumed outer limit of sediment transport (the closure depth). The CSL Kapiti assessments used one of the shallowest closure depths, the spring low tide level, and the output provided relatively low retreat distances, distances that are most likely to occur for a given rise in sea-level. There were two reasons why this approach was used. Firstly, as noted earlier, the response to sea-level rise often has the largest erosion hazard component value, and there is particularly high uncertainty surrounding this phenomenon thus making deep closure applications untenable. Secondly, to combine component probabilities such that the resulting hazard distance is “very unlikely” (1 to 10% chance of occurrence) a range of component likelihoods is required as if all values have low probabilities of occurrence then the combination will be unrealistically conservative (worst case) as components are largely independent of each other. 2013 Climate-change impact assessment for inlet interrupted coastlines. Published in Nature Climate Change, (3) 83 to 87. Coastlines in temperate climates are regularly interrupted by inlets which come in various sizes and forms (estuaries, lagoons and river and stream mouths). Such settings have always been popular for human settlement and Kapiti is no exception. However, inlet shoreline dynamics are the most variable found in any coastal environment and potentially hazardous unless managed. Inlet processes will be affected by climate change and such inlet change will impact upon adjacent open coast shorelines. This paper proposes a method of quantifying such open coast impacts. In addition to the adjacent open coast retreat from climate-change induced sea-level rise in a Bruun-type landward profile translation, sea-level rise will also result in basin infill to achieve inlet system equilibrium, and draw on additional coast sediment causing open coast shoreline retreat. Moreover, climate change-driven variation in rainfall/runoff will effect lagoon dynamics by flow-induced changes in basin volume and fluvial sediment supply, the nature of which may increase or decrease the inlet demand for coastal sediment. The paper describes a scale-aggregated approach for use in small inlet-basin systems and applies this to a range of such inlet systems. Results show the effect on adjacent shorelines of a Bruun-type sea-level rise response alone represents only 25 to 50% of total potential coastline retreat from climate change. Of the remaining response, basin infill was significantly greater that these rainfall/runoff impact. The CSL Kapiti hazard assessments for open coast adjacent to inlets used the usual approach of profile translation associated with the projected sea-level rise for assessing the climate change impact. This new research paper suggests that the CSL results may under-estimate the adjacent open coast shoreline response by not allowing for the other three climate-change drive mechanisms. This under-estimation could have particular relevance along the open coast shorelines adjacent to the (larger) Waikanae Inlet . However, the CSL approach intentionally allowed for other climate-change effects by not subtracting the effect of past sea-level rise incorporated within the longer-term component (NB section above on CSL Response/Comment). By Jeremy Mull and Peter Ruggerio. Published in the Journal of Coastal Research p1173-1187. This paper has particular relevance to the CSLs vs Komar short-term erosion method “standoff” described in the above section on CSL Response/Comment to the Panel’s report. Mull and Ruggerio compare three models commonly used to derive storm erosion using large-scale wave tank experiments and also using measured dune erosion from a particularly significant storm on the Oregon Coast. The three methods are: the Komar et. al. (1999) geometric translation model; the same model as the Expert Panel recommended for use on the Kapiti Coast, and referred hereafter as K99; the Kriebel and Dean (1993) equilibrium profile model, referred hereafter as K&D93, and the Larson et. al.,(2004) wave impact model. These fundamentally different models were selected as being potentially suitable for large-scale vulnerability analysis on exposed oceanic coasts with limited available information – thus giving the research some relevance to the CSL Kapiti Coast erosion hazard assessments. The authors found that the KD93 model provided the most accurate retreat distances. The K99 approach was described as deriving unrealistically large retreat distances, while the Larsen et al., (2004) model required a calibration co-efficient that ranged over an order of magnitude and consistently under-estimated observed erosion. The authors recommend the use of the KD93 model in large-scale vulnerability analysis along the US Pacific Northwest Coast. When applying this research to the Kapiti Coast, of particular relevance is comparison of the KD93 and K99 results derived from the three contrasting Oregon Coast study sites. In particular, the mean K99 value over-estimates the KD93 value by a factor of 2.3 (1.7 to 3.1). Now applying K99 to the Kapiti Coast (at 5 representative sites), and comparing the corresponding CSL short-term empirical/statistically-derived erosion computations, shows the mean K99 value over-estimates with the CSL values by a factor of 3.1 (1.6 to 3.8). There is broad agreement in over-prediction of K99 between the Mull and Ruggerio (Oregon) and CSL (Kapiti) results with the observed residuals being expected given the contrasting wave climates of these two environments. This finding provides additional support for the CSL approach being better suited to the Kapiti Coast than the K99 approach as advocated by the Expert Panel senior member Professor Paul Komar. By Tom Shand, Richard Reinen-Hamill, Paul Kench, Mark Ivamy, Patrick Knook and Bruce Howse. This paper describes a practical method of determining erosion hazard output for each probability level, i.e. the challenge alluded to in the above discussion on the 2013 paper reviewing sea-level rise response models. While inundation hazards can be assigned probabilities (e.g. 1% annual exceedance probability which is also described as having (on average) a 100 yr return period), the time-dependent nature of some of the erosion components rules out standard probabalistic approaches. The concept of using stochastic simulation to define erosion distances to generate a range of probabilities, rather than the industry-wide deterministic method used to define an erosion distance for a single predetermined probability, has been a recent objective of coastal hazard research. The method described in this research paper uses a distribution of values for each parameter to account for the expected variation. Parameters are then combined using a Monte-Carlo routine to produce the probabilistic forecast of future shoreline location. The method is still based on the same components used in the deterministic method, but can incorporate the wide range of approaches used for determining the value for each component. The method also enables the sensitivity of different input parameters to be quickly determined. The paper illustrates its outputs using a typical example. Interestingly, the likelihoods assigned to the CSL Kapiti parameter values (presented at the Expert Panel Hearing in December, 2013), were also processed and the combined output was reported to have a probability of occurrence of 4% which is in well within the 1 to 10% range defining “very unlikely”. In addition, the 50 yr very unlikely CSL computation was found to have a 89% probability of occurrence at the 100 yr time-span, this being at the upper end of ”likely” (66 to 90%). These results provide added confidence that CSL 100 yr erosion hazard output achieved the intended probability level, and that the 50 yr potential erosion output used to define erosion hazard for existing dwellings slightly underestimates the NZCPS requirement of a 100 yr likely value.